French import Gallic Chieftain charges into Sydney Cup calculations with a tough staying performance to win the Group 2 $300,000 Schweppes Chairman’s Quality (2600m) on Day One of The Championships at Randwick today. Gallic Chieftain, above, charges into Sydney Cup calculations with a tough win in the Chairman’s Quality at Randwick. Photo by Steve Hart. The Archie Alexander trained Gallic Chieftain was coming off a last start fifth in the $125,000 Yarra Valley Cup (1950m) at Yarra Valley on March 17 and was sent out at the double figure odds of $16. The addition of blinkers has helped Gallic Chieftain return to the winner’s stall and the six year old stretched out nicely in the straight after Golden Slipper winning jockey Damian Lane had settled the OTI Racing import in the second half of the field. Gallic Chieftain found the line strongly at the end of the 2600m to overhaul the Chris Waller trained Shraaoh ($8) with Semari ($19) getting the judge’s nod for third. Gallic Chieftain has raced once at 3200m for a third in the 2017 Listed $150,000 Sandown Cup at Sandown but the way he went to the line in the Chairman’s Quality clearly indicated that the step back up to the two mile won’t be a problem in the Group 1 $2m Schweppes Sydney Cup (3200m) on Day Two of The Championships at Randwick next Saturday. The well back Chairman’s Quality favourite Supernova ($3.50) also settled in the second half of the field and Brenton Avdulla was happy to stick to the inside fence in the straight. Supernova made up some ground up along the inside but couldn’t sustain the run and ended up in sixth position. Ballarat based Archie Alexander said after the Chairman’s Qulaity that the logical thing to do was to stay in Sydney and chase the big prizemoney in the Sydney Cup. “We came up here just for this race, but with the Sydney Cup in the back of our mind obviously, but you probably can’t go back home now so we will keep him here, keep him nice and fresh for a week, and tackle the big one,” Alexander said. Gallic Chieftain has firmed in the Sydney Cup betting at Ladbrokes.com.au from $26 to $15. 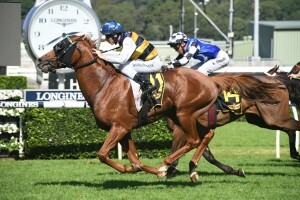 The post Gallic Chieftain charges into Sydney Cup with Chairman’s Quality win appeared first on HorseRacing.com.au.